This day is celebrated annually on May 19th each year with sports events held throughout the country. 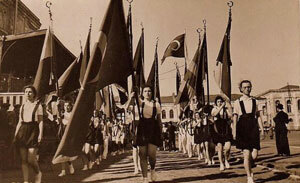 The tradition is for young athletes to carry the national flag from a Black Sea port called Samsun, where Mustafa Kemal Ataturk started Turkey's war of Independence in 1919, to Ankara. It takes about 10 days for the marathon and once in Ankara the President accepts the flag for the ceremony held there. Most people will attend local sport events held in their cities. Mustafa Kemal Ataturk in March 19, 1919 arrived in Samsun to divide the territories of the defeated Ottoman Empire. This day is considered the start of the Turkish War for Independence. He made another request to make March 19 Youth and Sports day which was later recognized by the Turkish government in 1938.